Home » Crock-Pot » Crockpot Chicken Mole – don’t spend all day slaving over the stove to make mole, here is a recipe to make it in a crock pot. Crockpot Chicken Mole – don’t spend all day slaving over the stove to make mole, here is a recipe to make it in a crock pot. Simple, Mexican inspired chicken dish that is ready to eat when you are. After having traditional mole, I decided to come up with a recipe that I could put on in the morning and let cook all day. This is what I came up with. 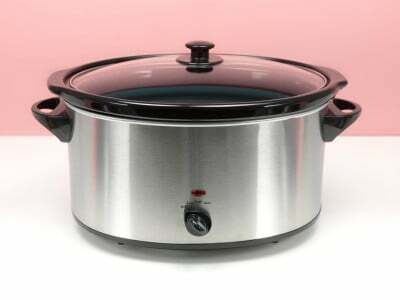 Thanks to eysterfamily for sharing her crock pot recipe. Don’t spend all day slaving over the stove to make mole, here is a recipe to make it in a crockpot. Place all ingredients except chicken into your crock pot. Mix well while heating on high. After chocolate is mostly melted add your chicken. Cover and cook the entire day, or at least 6 hours. Check taste for salt. To serve, strain sauce and retain. Pull chicken off the bone. Serve with warm tortillas, make burritos and serve with cheese and sour cream. You can also serve this over white rice. This is a recipe that is requested constantly at potlucks and my 12 and 7 year olds love it. Cook time says 2 hours. Then you say to cook the entire day or at least 6 hours. Which one should I go by? The picture shows a raw, whole chicken, and since the recipe does not say “cooked” chicken, that indicates raw. What would be the ratio to make this in a 2 quart slow cooker? I normally use a 3.5 quart one. Any good ideas for a substitute for the peanut butter?? Would almond or cashew butter work also?? I would most likely try the cashew butter, and then the almond butter in that order. Not sure how this would work out though. Let me know how it works out for you! You can see the product here, this 19 ounce package gets divided into six tablets.